So if you’re someone who watches Slashdot, Hacker News or Reddit you would see news that Canonical will be shipping a Shopping Lens for Unity in Ubuntu 12.10. This has resulted in a bit of public outrage from people who are concerned about advertisements in open source applications or even a Linux Distribution. I think the article on Slashdot has sensationalized a new feature that I would not consider an advertisement but instead suggestions. But lets take a look for ourselves and see if any ads really come up for a search term on Ubuntu 12.10 shall we? But lets also make sure that I am fully up to date with all my packages and that I am running Ubuntu 12.10 and have this controversial shopping lens installed that everyone is panicking over. Yep everything up to date with the shopping lens but no Amazon advertisements here not even a product suggestion. In any case, there have been suggestions for music and movies since Ubuntu 12.04 landed. So the fact that product suggestions are made in a highly precise manner based on your search is not something new coming to 12.10. Suggesting something is much different from blatantly advertising products. After all, we’re talking about a desktop that is integrated into the web and brings the web to your desktop. So enough with this FUD and take my advice below and heck feel free to leave a comment and share your thoughts on Ubuntu and why you like it or dislike it! Update 9/22/12 1:10 PM: an employee at Canonical shared a screenshot of him doing the same search and he is getting some suggestions despite us both having the same version of the unity lens installed. But I still stand by my assertion that the article on Slashdot is hype because I do not think integrated search results is the same thing as an advertisement and if you do not want these suggestions you can opt-out by removing the lens. This feature is still very much in beta and if you do not want it you do not have to have it and can remove it by running “sudo apt-get remove unity-lens-shopping” in terminal much like you can also remove and replace unity with a different Desktop Environment that may be more suitable for your needs if you dislike Unity. Update 9/22/12 4:05 PM: A user has filed a bug citing privacy concerns and the default nature of the Amazon results co-mingled into Unity dash searches. Update 9/23/12 11:10 AM: A user has opened an AskUbuntu Question about whether Amazon will get all the search queries and any other information. Additionally a boat load of new bugs have been reported about this feature: #1054782, #1054776, #1054746, #1054677, #1054282, #1053678 (Everything from Security Issues, Adult Content Being Offered, Incompatible Software suggested for sale etc). Joey Sneddon (OMG! Ubuntu!) and Ryan Paul (Ars Technica) both said on twitter they do not feel the feature will stick around very long. Update 9/23/12 11:36 AM: Mark Shuttleworth has blogged about the new feature. Update 9/25/12 4:38PM: I have drawn up a Technical Diagram of How I understand the Shopping Lens to work. So where are the suggestions, then? You searched for a term that must be on Amazon, and didn’t see anything. The screenshot on omgubuntu shows suggestions appearing when you enter the name of an application (Shotwell). Why the difference? Also, one of the main concerns voiced about this is “does every search I do locally get sent to Amazon?” Do you know anything about that? It appears it didn’t serve me any suggestions because they are possibly working on the backend right now or perhaps even a GeoIP issue. As others have suggested, if I click a ‘Shopping’ lens, I expect that to be searching online. But when I’m starting an application or finding a file, I don’t. This is only an issue because they’ve put those results in the home lens. So long as the user is permitted to go in and disable it, I could care less. I’m not a fan of things being sold at me while I’m just browsing the web, why would I ever want it as a part of my operating system. Things are sold to you on every operating system… Default Applications that a developer of a operating system chooses for you by default are being sold to you but you do have a choice to customize your experience to match your individual needs. Canonical is not taking personal choice away any more than other distros. Slackware does not try to sell me anything. It’s free. Everything I want to add to it is free, including the AdBlockers I use to make webpages show only content. Canonical are an abomination and step by step they are turning Ubuntu into a commercial platform so they can sell advertising space. They have ruined what was a brilliant distro and are slowly turning it into a walled garden, a la Apple. Whoever is talking about ‘is this obtrusive’ or ‘it can be uninstalled’ or ‘browsers have ads too’ is missing the point. The point is that your OS is supposed to be the ‘private zone’. And once you are on a website you are in the ‘3rd party zone’. They are breaching an important line with these ads. From now on, I have be suspicious of my own OS, because some software on my clean install might be spying on me and sending information to 3rd parties. Totally not cool. The shopping idea is great, similar to the Ubuntu One Music Store, but I don’t like that it automatically sends search info to Amazon by default in the main lens. A separated lens would be fine; if I wanted to do a quick search without opening a browser, I can specifically search with the lens. Also, there’s a bug open about filtering specific content (adult stuff) from showing up, which may not always keep things family friendly. Regarding ‘opting in’ or ‘opting out,’ I think that could even consist of using a lens specifically for a task or not. To search music from the Ubuntu One music store (go out and search the internet), I can specifically pick that lens. If I don’t pick that lens, searching locally is perfectly acceptable, but I don’t like it going online to search by default. Another way to mitigate this is some sort of ‘Lens Control Panel’ or integrate it somehow with the ‘Online Accounts’ feature, but I still don’t like it being automatically searched by default when I use the dash and type ‘Mumford and Sons,’ for example. I use Kubuntu. I’ve no idea what unity looks like, and I don’t know what a lens is. why isn’t this just an opt in? that asside.. imho this is part of the reason i *hate* windows installs on store bought computers.. tons of crapware (which i will now call “fundware” for ubuntu).. stuff i had to rip out of every new machine just to remove the advertisements from my field of view..
Ubuntu has been said to promote “community” and “choice”, but if you look at various issues regarding money, they didn’t really ask to Ubuntu council or anything before pushing them ( the magnatune/rhytmbox issue, the banshee issue, the mozilla/user agent google change, etc ). And the money doesn’t go to the dormant Ubuntu foundation, but directly in the pocket of the main sponsor ( and so that’s not really a sponsorship anymore in fact ). That cannot be opt-in because almost no one will opt-in for this, or likely, there will be less people to enable this if this is disabled by default than now. More ever, adding yet another question is IMHO something to avoid. I find quite funny that Canonical manage to disturb the ecosystem around free software by throwing lots of money ( and FUD, as seen by the repeated attack on Red Hat ) and in the end, discover that burning cash is not a sustainable business model, and so they try to copy Facebook, Google and all others by turning their community of users into something to sell. On a positive note, at least, they try to find a working business model after trying all others. The Ubuntu Council? You mean the Community Council? The CC does not decide things surrounding development thats never been its purpose. Ubuntu has always been a Meritocracy from day one and nothing has changed. It’s not really a development issue – someone has yet again decided to do something that is going to be poorly received by users and the broader community at whole, and there has been no discussion about it whatsoever. Canonical not making enough money to sustain itself should not be an excuse to accept stuff like that, and the fact that I can uninstall it doesn’t change the fact that it’s going to be enabled for new users, who are going to see advertisements when they start using their system. So this is why they insisted on Unity – it’s an ad platform. As if the Popularity-Contest and Zeitgeist spyware isn’t bad enough. You have to be a real sheep to use Ubuntu these days. …and people think I’m silly for sticking with 10.04 LTS. Oh well, one more year and then I find a new distro..
You don’t know how to “sudo apt-get remove” ? Yup, I know how. I also know that it wont help with the rest of Unity. This is just one more straw on the camel’s already broken back. Maybe broken for you but it works just fine for me. I have to agree with Unity being broken. At the very lest people should be able to agree that Unity’s implementation of Compiz is buggy at best. As for the Amazon ads, and the unencrypted sending of my searches, without notification, that is NOT cool. Im fine if at the end of the install theres a new screen saying “support Ubuntu by adding add-ons from our partners” with a list of new lenses to add and other stuff that Ubuntu gets money for. That would be fine. But when your average user will have no clue that everything they type into the lense is getting sent and filtered through Amazon.. that’s.. SOOOoooo shady. And it will change by the time 12.10 comes out or I am leaving for another distro, as I’m sure many others will. Ubuntu may have always been a Meritocracy, but it’s still one that depends on people using their software and keeping their users happy and (hopefully) safe. Your comment of “You don’t know how to sudo apt-get-remove?” assumes all users are comfortable at using the Terminal! Wasn’t Ubuntu the distro which championed the “click and use” for common man? A better approach would have been to ask the user during installation if they want to help Ubuntu with advertisement money or referral commission and let the user make the choice. At that point I would say Canonical is a meritocracy. The lens can be removed from Ubuntu Software Center just the same by doing a search and removing it. Do you know how meritocracies work? What affect does this have on Xubuntu? i think what they mean is if enough people switch to xubuntu that the lens would be ported to xubuntu. i dont think you can anyone can make the meritocracy argument here any more.. this isnt about platform darwinism.. this is a blatent ad revenue scheme where you try to convince us its for our own good, its the same mechanism people use for pop-up ads and why ad blockers are bad (“were just trying to bring you relevant offers you might like!”)..
im not sure why the ubuntu folks arent just being intellecually honest about this.. they know we dont want ads, and they’re not allowing an opt-in because they likely have an agreement on that with amazon. this is simple to defuse.. ship the lens with the new ubuntu.. allow it to be opt in with a full explanation of the data being shared.. not just some little paragraph hidden in the EULA that no one reads (Again.. this is another tactic from the popup ad folks… “you agreed to install adgator when you install farmville.. it was in the eula that we would be sharing your credit score!”). be honest, dont be evil, i dont see any reason you cant make some money for ubuntu without sacrificing our privacy and your principles. I am betting they have zero agreement with Amazon but instead have a Amazon Associates account and use the API nothing more. Canonical making money is for our own good because if Canonical doesn’t stay afloat then Ubuntu (and Xubuntu, Lubuntu, Kubuntu etc) does not exist as a distro. “apt-get upgrade” won’t give you new packages. Assuming this is a new package (which makes sense, considering it was only added on 9/20), you’d have to “apt-get update” to get new package lists. Then, since this is a new package, you would have to “apt-get dist-upgrade” to actually install it (however, it would be listed as held-back if you just did a normal upgrade and not a dist-upgrade). This all assumes you have a mirror that’s up-to-date. I don’t believe we have full fledged mirrors for development versions, so this shouldn’t be a problem in this case. I realize how to use apt but for the purpose of showing a screenshot it would not be possible to do update and upgrade and show all of the output plus I ran update prior and there are plenty of people who have the latest package and are not seeing any Amazon product suggestions its because they are likely using some sort of GeoIP function with the API. dpkg -s shows me I have the most update version shipping under -proposed. Way to go Canonical you made a crazy design decision yet again without any input from the community that will almost certainly make you lose more users. What now? Should we install gentoo. you’re assuming that all Ubuntu users have to use Unity — I’d recommend checking out Lubuntu and the LXDE. No assumption like that made at all… Ubuntu Users have always had personal choice to what DE or applications they keep or purge. It is simply summed up thus. I want to install an operating system not an advertising platform regardless of whether the OS is Open or Closed Source. My Internet connection is not being paid for by me for the benefit of ad companies to consume my bandwidth with their adverts. My OS experience has nothing, NOTHING to do with Amazon and my personal musical tastes have nothing to do with 7Digital. I am pretty certain that disk operations my OS performs will gain no beneficial boost from Amazon. I simply want an Operating System thats as fully featured as practical and as secure as possible. I fail to see how turning an OS into an advertising platform represents anything more than a breach of those requirements. Why the fuss when you know you can remove it.. The only problem with unity is that you dont get new versions like other desktop environments. You need the next version of ubuntu. Why so? Ah, the good old lies of the marketing guys. No no this is not advertisement, it is Sugggggestion, Newsletters, Special Offers… That you did not request, but can opt-out ! Change the meaning of words all you want, this is all pushing to you specific products (form a specfic vendor here apparently, not event a price comparing website or such) in hope that you will buy it, whether you knew you needed it or not. That has nothing to do with the responses you get when you LOOK for a specific product on an online shop, it is, and will always remain, advertisement. Now, buying through an affiliate link because you wanted to is another thing. If there is any website/company/whatever you want to support, there is no justification in buying anything on Amazon without being affiliated, it’s just a wasted opportunity – unless you disapprove the affiliation system as a whole of course. I expect for my OS to occasionally check for updates. That’s all the communication i expect built in by default. When I open a browser I then expect it to communicate with the url i navigate to. This amounts to buying a windows box from wal-mart with preinstalled bloat ware then i have to run decrapifier. Whats next wild tangent gaming? Also if i type nmap in to the search will i get the option to buy a book to run the FREE not sold program? Needless to say this is it for me. I’m switching to vanilla Debian because they don’t listen to the users who built them up but rather are marketing to the proverbial grandmas and casual user of computers. That’s all well and good. I rather people use linux but ubuntu is not for me. Now how can I replace the Canonical affiliate marketing ID with mine? Especially if I distribute copies of Ubuntu to others for free? Come on over to Arch Linux. Install minimal and add only the software you need. Even Mr Shuttleworth’s workaround Ie. “For example, you can hit Super-A and just search applications.” ignores the point completely. This searches Applications as well as “Apps available for Download” ie. queries a 3rd party server (AFAIK). Furthermore, it doesn’t search Recent Files or Downloads like the Home Lense does (and more) in the current 12.04 LTS incarnation. In fact, these new changes makes it so that *no* lense is local only. I understand your concern and am sympathetic to them. Previously I have been impressed with Ubuntu. Even though it was started by a man who sold out by selling the only reputable independent certificate authority to the CA mafia. Then he took his money and used it to become the BD of yet another diet. Despite the benefits of Ubuntu, I guess I will look around for this years better diet. In both cases, I typed “diet” and the spelling checker replaced it with “diet”. I give up. I type the four letter abbreviation for “distribution” and even tried putting it in quotes, but the spelling overload outsmarted me. I wonder if this trackware will be included in Xubuntu/Mint/Not unity ‘buntu releases? 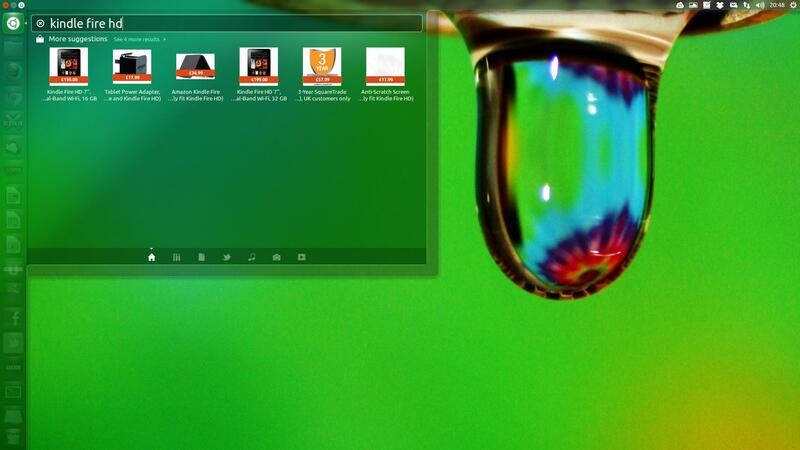 I stopped using Ubuntu when Unity vomited its bloated waste all over my screen. Eh, I use Mint for the better desktop and color scheme now I can add adds onto that list. I’ve been using Ubuntu since 6.06 as my primary OS. I’ll give the Amazon shopping lens a shortlived chance. If I don’t like it I’ll rip it out. I hope it does work out though, clearly Canonical is looking for ways to either make Ubuntu more profitable or profitable in the first place. I ditched Ubuntu as soon as they started with this “Unity” nonsense. I know I could uninstall it, and install some other window manager, but why would I, when there are others that come by default the way I like them? Thus far I’m really liking Cinnamon on Mint. You like Cinnamon on mint despite that Linux Mint disables Kernel Security Updates? I think the amazon add-on is a cool thing. But I must admit I have ditched Ubuntu as well as the Unity desktop is just too unnatural for me to use. The icons alone in the dock alone screams ‘ugly’ at me. The hidden programs menu irritates me. The placement of the close/minimize button for maximized windows is weird. And the dock seems for me more natural when placed in the bottom or to the right. It is not that Ubuntu is changing – I like changes. But as it is now I’d prefer Gnome 3 over Unity – but I’m sticking with OS X for the time being. You can uninstall the unity-lens-shopping but the “More suggestions” is still there. How can we remove it?